Fundraiser by Tom Bartels : Family of 7 needs help getting back on their feet! Family of 7 needs help getting back on their feet! A couple weeks ago I encountered Jeremy and his family, who were sleeping in their van. It was cold and he couldn't have the van running because he needed to preserve the gas. Jeremy told me his wife and 5 children were all inside the van. His story of survival was an inspiration to me. Jeremy and his family have tried everything to get on their feet again but there simply isn't enough funding in any program to house him, his wife, and 5 children. I have never been more heartbroken over someones situation. Myself and a couple others have helped out with what we can but it is not enough. Jeremy was fortunate enough to get a hotel room for a few nights, but he and his family will be back in the van as of tomorrow. I'm asking you to give what you can to help them out of this situation. Your money will help them with temporary housing, food, clothes, car insurance on the van, and gas to help the family get to and from school and job interviews. If the goal is reached then it will be enough for a deposit and first months rent for a new apartment. 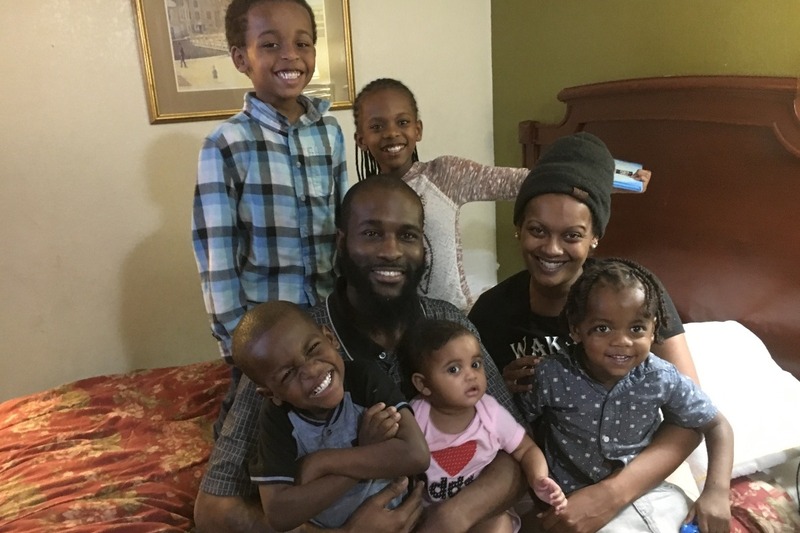 The family has been accepted and currently enrolled in a great organization that can really pave a smooth path into getting Jeremy, Rosaye, and their children in a better situation! Marie and I are working with other organizations across the Midlands to ensure their success as well! Many thanks for everyone who has contributed towards this goal. I am currently managing the withdrawals for Jeremy and Rosaye. They are being very mature about what this money is being used for and are extremely grateful for all your help. They've allowed me to be a oversee the withdrawals with paying their bills and other things they need. Please feel assured that your money is going towards a better future for this family. Marie and I are blessed to call ourselves friends with such a great family and no longer strangers. We are so incredibly overwhelmed with the love and support everyone has shown this sweet family. Thank you all for your continued support. Through sharing this story we have been able to connect this family with Family Promise of the Midlands and. Goodwill Employment. Multiple people have sent over job leads. Jeremy has his first interview in the morning. A sweet family has paid for a week hotel stay and also for three meals a day at a local diner. Many people have dropped off clothes, money, and gas cards. Just saying Thank you could never be enough. They still have some hurdles to jump but with everyone's love and support I know they will make it. We will continue to update.